Current technology allows music—any off-the-cuff work —to be recorded and released at amazing speeds to an eager public. Of course, it’s a fine line between off-the-cuff and half-assed. Here, Bloc Party goes for the latter, producing a disco-tinged 10-song affair that leaves the brain almost as soon as it is done playing. 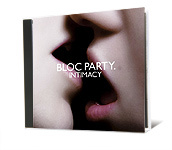 An online-only release, Intimacy sounds like it needed more time to come together, or a producer just to say “no.” Riding the same crest of neo-post-punk (does that phrase make any sense?) as Franz Ferdinand, Bloc Party proved to be a tougher act, one willing to dig a bit deeper into those Gang of Four albums than some contemporaries. Here, they head full-force in a new direction, one with vaguely funky beats and unremarkable melodies. It’s a shame, because I love the instant-release model, but the final proof is always in the music, and Intimacy doesn’t have it. The first question is: Does the world need another Bette Midler compilation? After all, it’s not like she has been overly prolific since the last one was issued in the 1990s. How you answer that will determine whether this diffuse collection of tunes drawn from a 35-year career is worth the money. On a basic level, it serves as a solid career overview, taking us from The Divine Miss M all the way through to 2006’s Cool Yule. Personally, I don’t need to hear “From a Distance” ever again in my life (or the rest of “Beaches,” which makes up a good chunk of this collection). But the early swing tunes and the sometimes rockin’ covers are fun for a listen. Plus, “The Rose,” which I owned on a single back in the dim days of the late 1970s, lets me bond with my less-than-divine 10-year-old self. Either way, though, we have the newest compilation to decide on. Around 1996, it seemed Tricky was the future of music. His spare, “trip”-hop captured the imagination like little else out there, sounding like it had arrived from the future fully formed. His voice, so gravely that it threatened to warp your stereo woofer, packed amazing intensity in a seemingly laid-back style. But after a couple of excellent solo albums (and a turn as an early member of Massive Attack), returns began to diminish, until he fell off everyone’s radar. 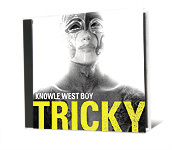 Knowle West Boy isn’t a return to the heights of Pre-Millennial Tension, but shows some greatness still in Tricky’s musical tank. Over the course of the album (named for the creator’s home district in London), Tricky paints a complex picture of modern-day life, loaded with musical and cultural influences from here and far. Through it all, his trademark delivery is intact. And the music still sounds like it comes from the future. Heavy metal is, by far, the gayest genre of hard rock (though not necessarily gay-friendly). After all, it’s music dominated by long-haired, muscled boys wearing tight leather and spandex, crooning like castratos, and loaded with enough flashing lights and pyrotechnics to make the hardest clubber’s heart skip a beat. So, it shouldn’t have been a surprise a decade back when Priest leader Rob Halford came out of the closet. Now, he’s back in the fold, and, in typical maddening heavy metal style, the band has made a two-CD concept album. It’s as mad—and maddening—as you would think, with some good slabs of heavy gothic metal interspersed with pretentious dreck. As always, Halford is the real champion here—his epic voice still has the power to make even the silliest lyric sound grand.